In April return to Greece for culinary inspiration. This month’s recipe is a risotto dish much loved in my homeland and to make it I am using seasonal organic Greens from Blaencamel Farm in West Wales. 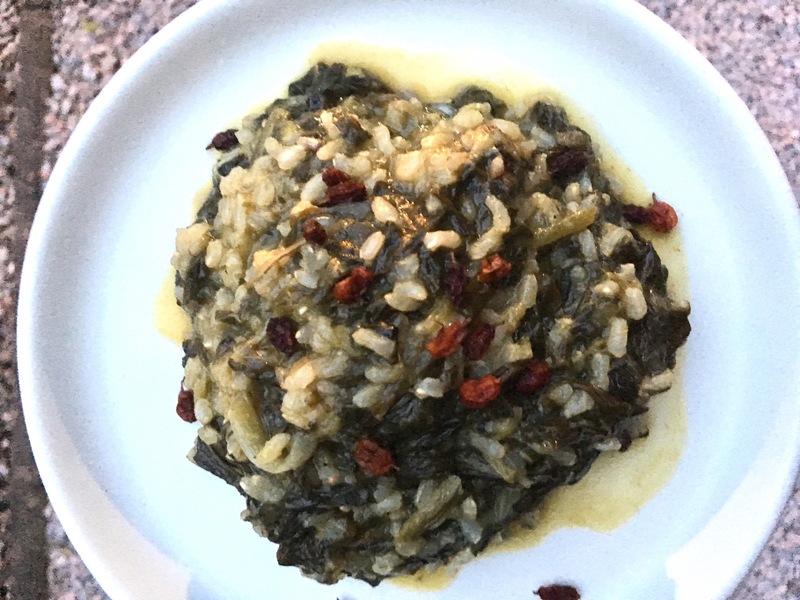 The key difference of this Greek risotto, called ‘Spanako-rizo’ or ‘Spanakoprasó-rizo’ is that it is less complicated in its cooking process (when compared to its Italian cousin) and it uses a lot of greens as the star ingredient rather than focussing on making a creamy rice. Whilst the rice is also added before the water it does not follow the Italian risotto method and you add all the water at once simmering the rice slowly to complete the dish. Traditionally this dish is made with a rice called Karolina. In the UK, you can find this in Greek specialty shops, but also on the shelves of many of the Middle Eastern shops where you should seek it as Egyptian Rice. It is a short grain variety which keeps its bite when compared to Arborio. If you cannot find Karolina/Egyptian rice why not try Thai Jasmin rice which I find is a great replacement for many Greek recipes. In fact, as I am not a purist, I recommend that you try this dish with all rice varieties to find your preferred version. Chard is regarded a wild green in Greece and has traditionally been foraged. Now cultivated widely in farms such as Blaencamel it has become a staple of our diet in the UK. Which is why I am using it together with spinach. Its meatier leaves, organic spinach, delicious Welsh leeks, foraged wild garlic and wonderful onions complete this version of the dish. In fact, Blaencamel farm’s April box will include all the ingredients you need to make your Greek Risotto. A perfect gift of the emerging Spring time and a great dish to help your body detox the heavy flavours of winter! 1. Coat the base of a 20cm pot with olive oil and sauté the onion and leeks with one tsp of salt until soft and translucent. 2. Add the tomato paste and stir well. 3. Gradually add the chopped greens (spinach, chard, wild garlic) so that wilt slightly. 4. Add the raw rice and mix well. 5. If using chop the sea buckthorn berries roughly or crush and add to the rice and green. 6. Add the lemon juice, around two cups of boiling water, dill (if adding), another teaspoon of sea salt and the pepper. 7. Simmer for 20 minutes or until the water is absorbed. 8. Serve with more crushed sea buckthorn, some feta cheese and drizzle with raw olive oil. 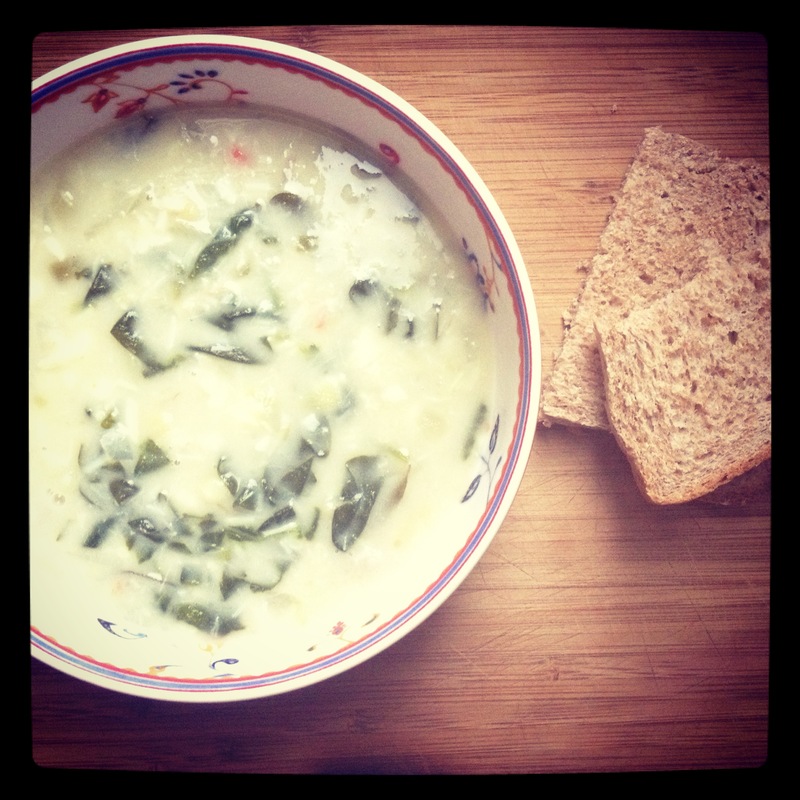 This entry was posted in Greek cuisine, Recipes, Vegan, Vegetarian and tagged blaencamel, chard, greek food, organic greens, recipes, risotto, spinach, Wales, wild greens. Spring is here! I am writing to you from one of our local cafés. Its wide French doors are open to an outdoor terrace. It’s still light and warm and a soft breeze just brought in scents of blossom (and something delicious cooking in a kitchen). 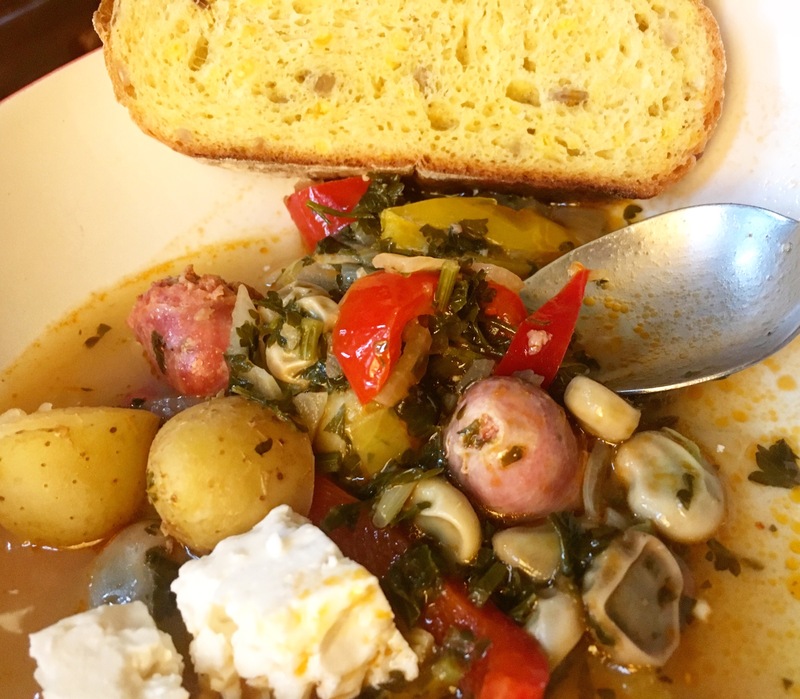 I have chosen to share with you the recipe for Tourlou, a mixed vegetable dish that tastes like spring and summer to me. A fridge chilled portion of it with some crumbled feta (surprise, surprise!) is just as nice to eat as straight after cooking or cooled to room temperature. But I’d prefer the chilled version today because it makes me think of Vourvourou, my friend Maria and resting in the shade in her company sipping a chilled beer (sigh!). Back to cooking! Tourlou is an easy recipe and great for using a medley of vegetable. It can be a light evening dinner on its own or served with rice, a delicious side dish or alternative to salad, and a fantastic tapa or meze. And apparently Tourlou is the same as briam only it’s cooked on a hob- here’s something new for food geeks like me. Wash all vegetable, peel the potatoes, and dice it all in five centimeter (large) chunks. Sauté the onion and a pinch of salt in about two Tbsp olive oil for a couple of minutes. Add one or two more Tbsp olive oil, the vegetable, toss and fry for about five minutes. Add the garlic, let it fry for a minute without burning and add the tomatoes. Add the sugar and also season with salt and pepper. Lower the heat and simmer for forty minutes or until the potatoes are soft. Add the chopped parsley at the end or half way through the cooking. For a good Tourlou do not to stir during simmering to avoid breaking the vegetable as it softens. The tomatoes should have enough juice for all the vegetable to cook but halfway through cooking check if you need to add a couple of Tbsp of water to make sure the potatoes cook. Replace potatoes with other root vegetable such as parsnip if you like. I prefer cooking Tourlou with more aubergine and one courgette. Use any vegetable you like. Okra is fantastic in tourlou but might take a bit longer to cook. For Briam use the same ingredients, add a little bit of water and cover a baking tray with foil. Slow cook for about an hour in the oven. 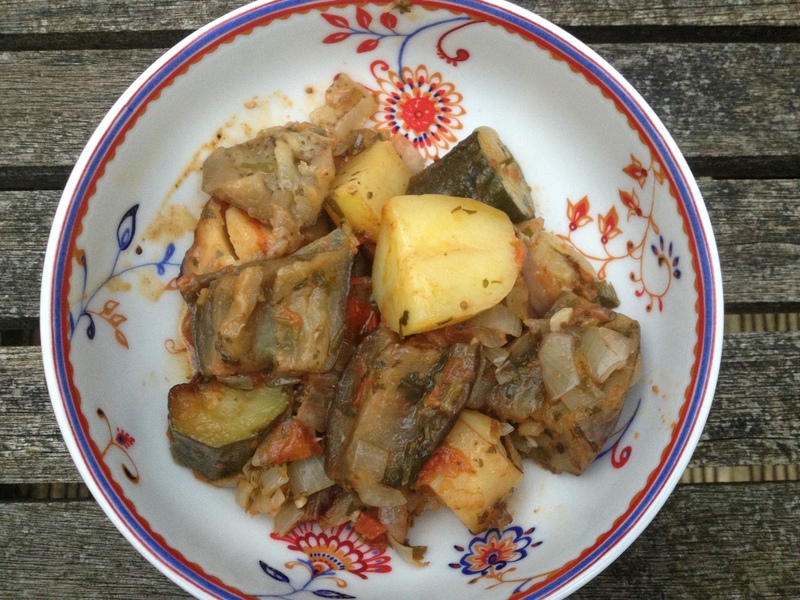 This entry was posted in gluten free, Greek cuisine, Recipes, Vegan and tagged aubergine, Brian, courgette, easy cook, food, Greek ratatouille, mixed vegetable, recipes, summer recipe, tourlou, vegetarian. I was in Kerala in October 2012 and it was a delight in more ways than I could ever begin to describe. One of the reasons is of course that Keralan cuisine is at the top end of the eating experiences that India could offer you. Kerala is in some ways gourmet India, a land blessed with tropical fruits, vegetable and spices and the starting points of many trails of wealth and cultural influence. If you are a culture vulture, a foodie, and a seeker of genuine community spirit, serenity and natural diversity you should make some time to visit Keralan land. The stew dish I am introducing today is not one I tried when in Kerala- when by the way I was delighted to wake up to savoury rice puddings with egg curry for breakfast. I learned how to cook Istoo on my return to Wales and whilst reading Vijayan Kannampilly’s, Keralan Cookbook. It is very easy to make, it is light and nutritious, and below is my fish version of it, which I hope you enjoy. Place the potatoes, ginger, onions, chili in a deep pot and add enough boiling water to cover the ingredients. Season and simmer until the potatoes are just soft. Add the fish cubed in big chunks, and if the fish is not covered add some more boiling water. Simmer for another 5 minutes or until the fish is cooked. Stir in the coconut milk, add the coconut leaves and heat to a low simmer . Option: add the washed spinach leaves to the stew as you do this. Once the stew has reached its simmer turn the heat off. Heat the coconut separately or other oil and pour it in. Taste and season more if necessary before serving . You can find out about what fish you should consume to minimise your impact on our sees at the Marine Conservation Society’s website: http://www.goodfishguide.co.uk/. Look for alternatives to monkfish for this stew. You can add two of the coconut milk tins and some water for a thicker stew that is not as strong in coconut flavor. Or for a more soup-like version of the stew add some three tins of coconut milk and some more water. This entry was posted in gluten free, Recipes and tagged coconut milk, coconut milk recipe, fish soups, fish stews, food, howtousecoconutmilk, India, indian cooking, Istoo, Kerala, Keralan cooking, Keralan stew, recipes, soupswithginger.